Immediately what strikes you, which unlike most minivans before it, is design. 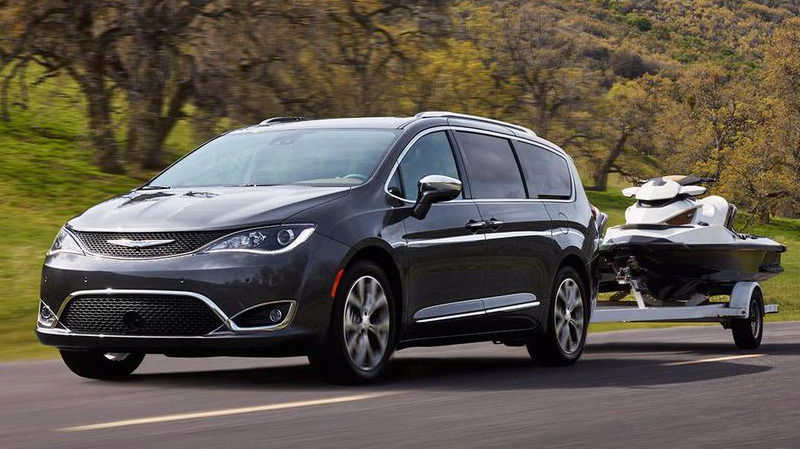 Image was a big problem with the entire minivan segment, so Chrysler set out to get it right with the 2017 Pacifica ensuring design chief Ralph Gilles and his team successfully accomplished that, and they did. Some favorites commonly mentioned are; body lines highlighting both front and rear fenders, 20-inch polished aluminum wheels, and finally the stunning projector headlamps outlined by LED pipes with chrome bezels, all which tie into the grille. Created to be in a league of its own, the Chrysler Pacifica is the most family-friendly minivan in its class. Functionality and purpose drove its creation, leading to one impressive ride. The redesigned headlamps on the Chrysler Pacifica are as beautifully sculpted as they are effective. Available LED lower light pipes and headlamp bezels are finished in chrome for an integrated appearance with the upper grille. The flowing chrome elements of the grille blend seamlessly into the projector headlamps. The Chrysler Pacifica Limited offers impressive available 20-inch polished aluminum wheels. Kids have a natural love of the great outdoors, from colorful sunsets to cartoon-shaped clouds. 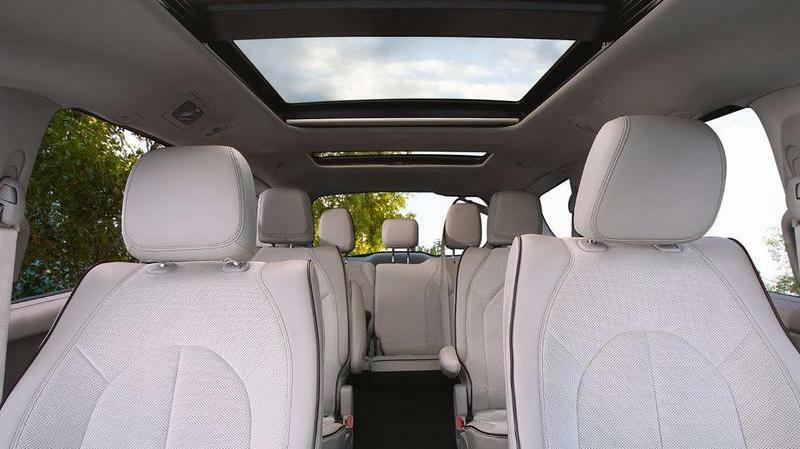 Keep them connected to nature—even on the go—with an available tri-pane power sunroof that welcomes the outside in. Interiors were always the focus of van’s and yet again Chrysler gets it right, possibly leading the segment, with helpful seating features like Easy Tilt that allow for quick and spacious third row access without removing second row car seats, with both rows that fold flat (Stow ‘n Go) into the floor allowing for massive cargo capacity. You do not need to remove seats here. Chrysler claims 243 different seating configurations. With comfort as a top priority, the Pacifica offers seating for up to eight+, so there’s plenty of room for the whole family. First-row occupants enjoy impressive legroom that accommodates longer legs. Along with its Best-In-Class cargo volume, the Pacifica Stow ‘n Go® Seating allows for up to 243 seating configurations. Not only is there an amazing amount of cargo space in the Chrysler Pacifica, there’s a lot of intelligently designed usable space as well. The space between the center console and instrument panel is a great place to stow wallets or purses, the center console provides storage for smaller items and the instrument panel drawer provides covered storage for items that you want easy access to. With the most innovative seating and storage in its class+, the Pacifica offers 243 seating configurations with the Stow ‘n Go® Seating and Storage System and it allows you to stow the second and third rows without having to remove the seats. This provides the Best-in-Class cargo volume+ and gives you the ability to carry up to eight passengers. Before you know it, snacks, dirt and crackers cover the floor. Fear not. The available Stow ‘n Vac™ powered by RIDGID® is the most powerful integrated vacuum in its class+ and easily extends throughout the entire cabin—ready to keep your machine clean. Families have a lot on their hands, so we designed the Chrysler Pacifica with convenience front and center. With a push of a button in the cabin or on the key fob or with a kick of your foot by the sensors outside the vehicle, the available dual power sliding doors and rear power liftgate open effortlessly. And when it gets time to empty those hands, there’s 197 cubic feet of cargo capacity+ with additional storage in the second- and third-row cargo bins. The days of climbing in through the liftgate or removing a child seat to get into the third row are over. The Class-Exclusive second-row Easy Tilt Seating+ lets your passengers access the third row easily with the simple lift of a lever. Safety concerns have been addressed with a host of collision prevention technology which give you a taste of what to expect in a self-driving vehicle combined with over 100 other standard features. It’s tough to choose a favorite here since all target individual key areas of driving. However, in busy cities, Parksense and Adaptive Cruise Control will be your best friends and buy you time to appropriately respond to situations. If you unfortunately get into an accident, high-strength steel utilized throughout 65% of the Pacifica will increase your odds. 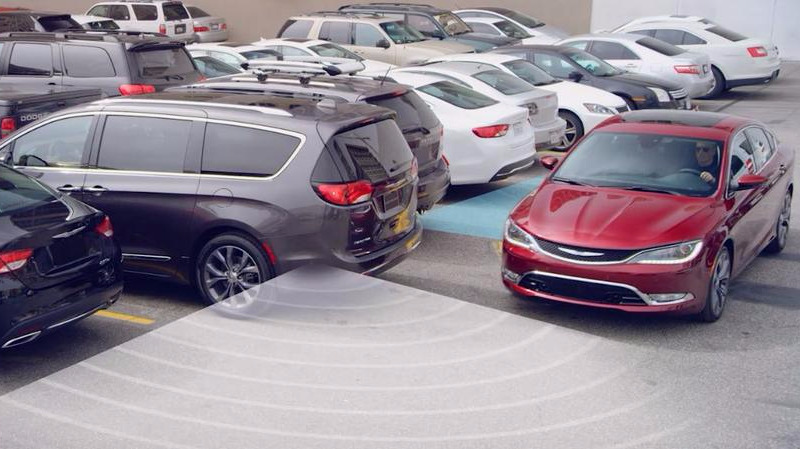 The Chrysler Pacifica does more than just help keep you safe and secure—it helps keep you on track too, with available LaneSense® Lane Departure Warning with Lane Keep Assist+. It uses a camera-based vision sensor to detect and measure vehicle position within lane boundaries. If an unintentional lane drift occurs (when no turn signal is applied), the system will engage, providing a visual warning. Providing a gentle corrective action, it will ensure you stay in the lane. It can also monitor if your hands are on the steering wheel and cancel an unintentional lane change if you don’t return your hands to the wheel. Wouldn’t it be nice to have an extra set of eyes? 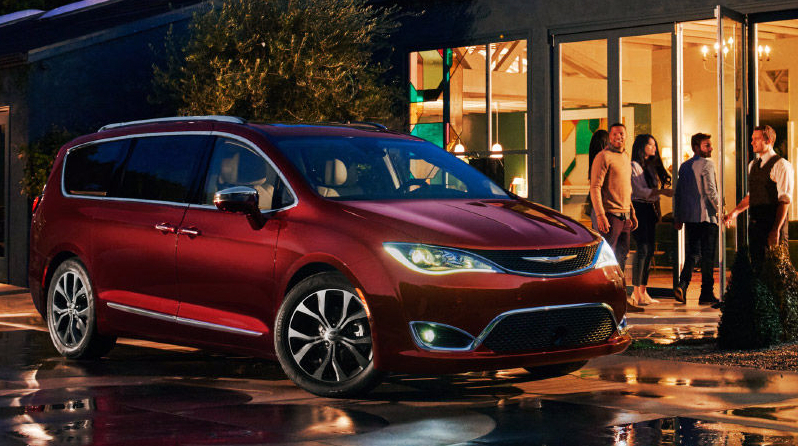 The available Forward Collision Warning with Active Braking System+ on the Chrysler Pacifica is the next best thing. It utilizes radar and video sensors to detect whether the Pacifica is approaching another vehicle or an obstacle in its path too rapidly and assists you in avoiding an accident by providing audible and visual warnings. If you still don’t respond, the system will provide autonomous braking. An available 360° Surround View Camera+ provides a bird‘s-eye view of the Chrysler Pacifica and its immediate surroundings, using four cameras positioned around the vehicle to create a fully stitched image. Dynamic gridlines help guide you, with the ability to select between front cross-path and rear cross-path views. The next phase in the evolution of cruise control is here—available Adaptive Cruise Control with Stop and Go+. It’s a more intelligent cruise control system, utilizing radar and video sensors to identify vehicles in its forward path and maintaining a set distance between the Pacifica and the vehicle in front of it. Adaptive Cruise Control with Stop and Go has full functionality between 0 mph and highway cruising speeds to help keep you at a safer distance before accelerating again. The available ParkSense® Rear Park Assist System with Stop+ helps detect obstacles near the rear of the vehicle to help you maneuver into tight spaces at parking speeds. A graphic display in the instrument cluster notifies you of the proximity of an object and the system will bring the vehicle to a full stop, if necessary to help avoid a collision. When moving in reverse, the Rear Cross Path Detection system will alert you if the sensors detect vehicles and/or objects crossing your path. Much like the exterior and interior, how it drives is not what you’re used to in the typical minivan, in a good way. With a Pentastar 3.6-liter V6 Engine mated to a 9-Speed Automatic Transmission, making 262 lb-ft torque and 287 horsepower, it’s said to feel like a midsized car. Getting up to speed off the line is easy, taking over vehicles is a breeze. Aside from power, this V6 is rated for 28MPG combined. If you opt for hybrid expect around 80 MPGe. When you spend less money at the pump, you have more for family fun. The Chrysler Pacifica with the 3.6L Pentastar® V6 gasoline engine offers unsurpassed highway fuel economy at 28 MPG, while the hybrid models get an amazing 80 MPGe. And with the most horsepower and torque in its class+, Pacifica gets outstanding mileage without sacrificing performance. Strength is a strength of the All-New Chrysler Pacifica. The available Trailer Tow Group package includes a class two hitch with two-inch receiver providing up to 3,600 pounds of towing capacity+ – that’s Best-in-Class towing capacity+. So for those times when you want to transport toys that are too big to fit inside the spacious Pacifica interior, we’ve got you covered. Families know that having stability is always important. Electronic Stability Control+ (ESC), standard on all Chrysler Pacifica models, monitors your steering input and vehicle motion. Upon sensing a difference between your steering input and the path the vehicle is actually traveling, ESC applies selective braking and throttle control (if necessary) to help guide the vehicle back onto your intended course. A family minivan should be reliable and ready to perform. With unsurpassed 28 highway fuel economy, the All-New 2017 Chrysler Pacifica is the best road trip minivan in its class. The 3.6L Pentastar® V6 engine complements the Pacifica and is capable of taking you wherever you’re headed. Life is just better when you’re entertained. That’s why the Chrysler Pacifica offers the most advanced entertainment system in its class+. The available Uconnect® Theater+ features a dual-screen Entertainment System with both a Blu-ray™ player and a USB video input that also allows you to connect via Bluetooth®, and HDMI. Sync up your compatible smartphones, tablets, laptops and gaming devices to the available 10.1-inch seatback-mounted high-definition touchscreens. With Uconnect Theater+, passengers can bring their lives along for the ride. Control and convenience are at your fingertips—literally—with the available 8.4-inch Uconnect® Touchscreen interface. Enjoy integrated Voice Command, Bluetooth® Streaming Audio, Hands-Free Calling, Voice Texting (not compatible with iPhone mobile devices) and more. Get help from Siri® Eyes Free, the iPhone®mobile device digital assistant. You can even customize your home screen with your favorite apps and tools. The standard active noise cancellation helps ensure a quiet ride. Your children’s naps on the road just got more peaceful and trip conversations just got better. That's why Pacifica is the quietest vehicle in its class. DJs Mom and Dad are always ready to rock the party with the available 20-speaker Harman Kardon® Premium Surround Sound System, plus countless tunes from the available SiriusXM® Satellite Radio+ with a one-year subscription. The Chrysler Pacifica has definitely obliterated this segment. It's legitimately near perfect in every manner. Performance to haul trip equipment. The looks to really stand out, especially as a mini-van. The infotainment to keep the buggers busy whilst on the road at any time, and to keep myself entertained of course. Most importantly, all the safety equipment I want to ensure whoever is in my vehicle is as safe as possible as well. They really hit the nail on the head and developed a winner with this one here. I agree. They definitely have a winner. In addition to young families, they need to market it to baby boomers, like myself? It's great for the grandchildren and has lots of space for those long road trips, or to spend a few months in Arizona for the winter. 1. haul kids around for sports activities (hockey & lacrosse) for long trips and keep them comfy, entertained, and split apart which avoids/reduces conflict (7 seat option). 2. haul multiple adults around in comfort and style without embarrassment. They feel like they are sitting in "First Class"
People have always thought I was weird, strange, etc. as I bought my first Caravan LE my senior year (still own it). Since then I have owned 29 other Chrysler vans, waiting for the 31st, a 17 Pacifica I ordered.....I can tell you over the years people that said they would not be caught dead in a minivan tried it and some of them are on the second or third. I have never had kids, but I like sitting up higher for my back, I like that I can be the one that all the friends neighbors drives us all to our weekly dinner night out or go to gamble in Oklahoma, or have hauled so many things, moved people, etc. Road trips, camping etc. Each time a refresh or a total redesign it is better than before and I thought what else could they do. I loved my 2011, 2012 and 2014 and thought I will keep the 2014 and even bought the lifetime warranty, but after I saw all of the technology (that is the future) I thought better go ahead and buy, put the lifetime warranty and enjoy! Did you buy a new van every year for 30 years?